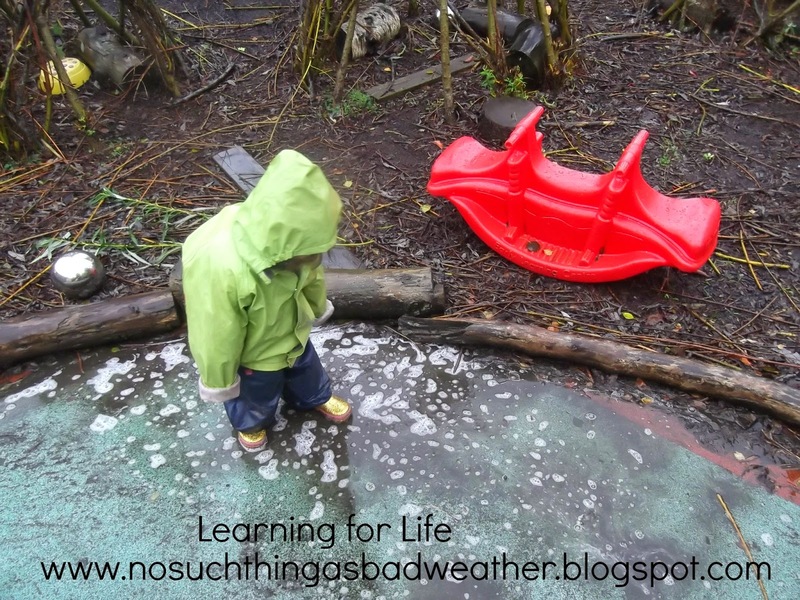 Today proved to me what an amazing set of parents we have, they have truly bought into our outdoor play approach & fully understand that there really is no such thing as bad weather. It was still quite dark at 8.50 as the children arrived & the rain was really heavy & unrelenting, yet as each parent arrived not one of them batted an eye at the idea of us being outside. Some stayed to help their children into their rain gear while others headed off saying 'Off you go & have fun in the puddles'. 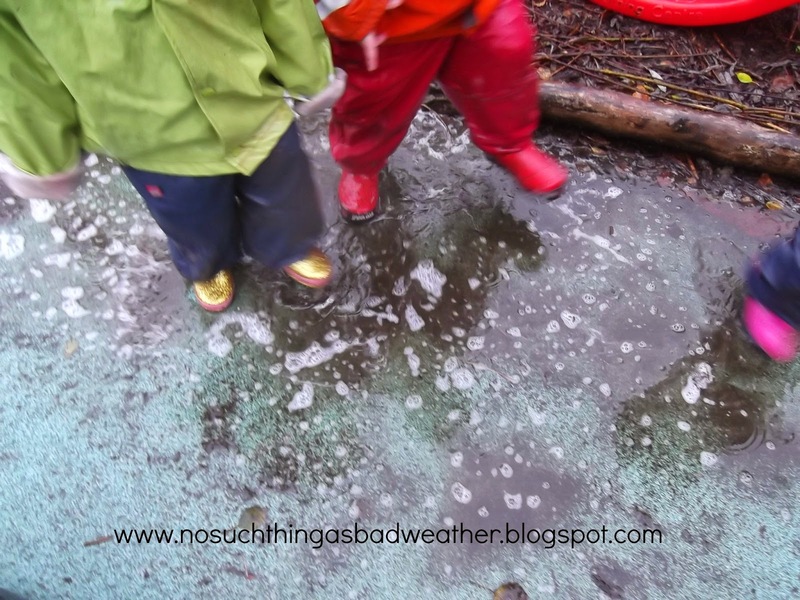 I love really heavy rain as we use it as an excuse to bring out the powder paints & decorate the playground using the rain as the mixer, today I also brought out some old shower gels that I had picked up in the scrap store last week, so when the children jumped in the puddles thye could make bubbles. 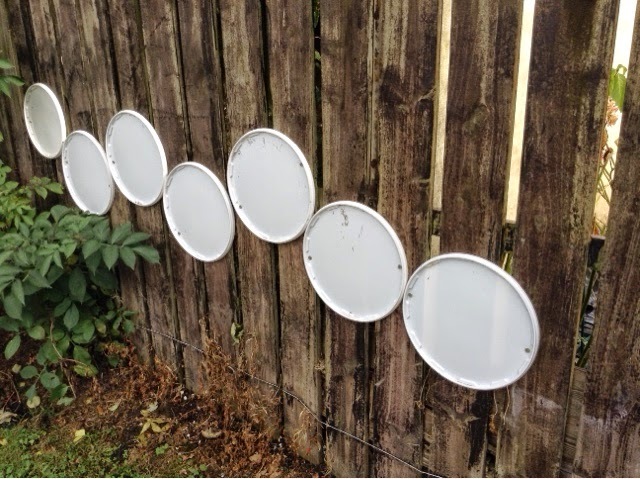 We were outside in the heavy rain for over an hour & almost all the children got on their rain gear & just enjoyed playing outdoors, they were so excited that the water barrel was full again - they had emptied it last week & were most disappointed that it hadn't rained since to fill it up again. They made soup with the pumpkins we had been pounding last week & enjoyed going down the slide really fast. It was particularly heartening to see one child, with sensory issues, put on his rain gear & enjoy just standing in the rain & jumping in the puddles - a major step forward for him. Outdoor Play Party - A whole new class! My new class are now all one big group now, they have been in school for almost 7 weeks & in the big class of 28 for just over 2 weeks. It never ceases to amaze me how different each class is & how they use the space in unique ways - this is the one aspect of my job that I love & the reason why it never feels like I am doing the same job year after year. This class has 17 boys & 11 girls but it doesn't feel that way, the girls so far are the more dominant force in the class, they decide what games will be played & where & when, the boys tend to trail after them. So far hide & seek & chasies (tag) seem to be the most popular games - I honestly don't ever remember a class introducing hide & seek either by themselves or this early in the year. They love the mud kitchen & after a really dry September, they have embraced the rain of October & loved having water to play with in the kitchen. Mrs Carson's dad was good enough to make us a water station for the kitchen from a couple of pallets & some of our Cosy bowls. Our new water station - adds a new element to the mud kitchen. For the first time ever, the children began to try to climb the willow dens - 2 boys started climbing up the inside like spiderman but then realised they couldn't go too far inside & moved outside, one got right to the top of one of the dens. We could have stopped them but as the willow are very strong & they'll only be able to see the branches to climb in the Autumn & Winter, we decided to let them get this climbing urge out of their systems. After a week some are still climbing the dens sporadically but it's not like all 28 are lining up to scale up the dens. 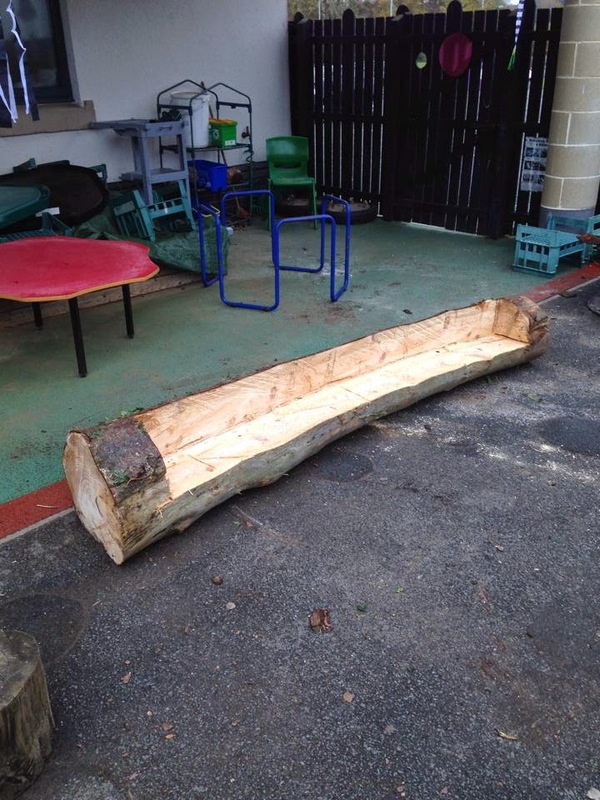 We have had 4 visits to Bear Woods & 2 as a big class & they are enjoying this space as well. The ropes are proving a big hit but so are the books that we have in 'we go' storage system on the fence. The 'We-go' storage system allows us to have books, gloves, hats etc. to hand in Bear Woods. We have also had a practice run with the fire circle - where they learned about not running across the fire circle & how to move from seat to seat by walking around the back of the logs. Then on Friday we had our first fire - a disposable BBQ - when we cooked some popcorn. Considering it was the first time it went very well & only a few forgot about how to move about the seats without crossing the fire. I had picked up a load of mouse mats at the scrap store over the summer with the intention of using them as seats up in Bear Woods but they have proved perfect for the fire circle when the logs are damp & it saves having to make everyone get into their rain gear just to sit on the logs. Mouse mats make perfect seat pads on damp days! As the weather gets colder & damper it will be interesting to see how this class reacts to the challenges this will bring & how it will impact on their play. A very kind past (and future) parent made this new seat for us! We'd appreciate it if you included a link back to this post (either in your post or sidebar) to help us spread the word about the importance (and fun!) of outdoor play! In return, we'll gladly further share your post on Facebook/ Twitter/ Pinterest. 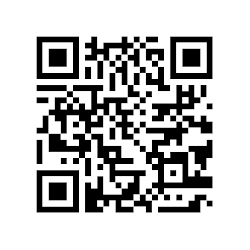 Please feel free to grab the Outdoor Play Party button from the sidebar and/or include a text link back. Please note that by contributing you are giving permission for an image and link to your post to be republished if featured. (If you have been featured, please feel free to grab the 'featured' button from the sidebar.) 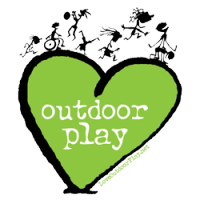 Share your ideas for outdoor play activities with us every other week! I don't often go for controversial statements on my blog but here goes: my grammar school education stifled my creative side at the age of 11. At primary I was a fairly good all round student who enjoyed all subjects equally but once I started grammar school I was being constantly told that I was no good at certain subjects or needed to work harder. This was especially true of the more creative subjects like art & home economics (or domestic science as it was in my day) but also maths & science. So I think around the age of 12 I began to actually believe that I was no good at art or drawing or thinking creatively & I shut down that side of my brain & concentrated on bring more academic & 'wordy'. I would also say I began to believe that I wasn't practically minded as I was instead bound for university & an academic route, I often heard it said that many teachers (university graduates in general) have no common sense & I really think I believed that. 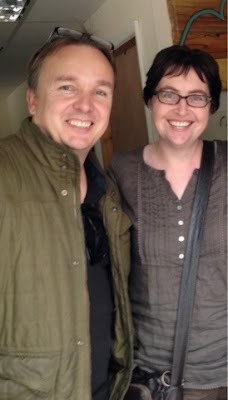 Fast forward to 2013 when I had the opportunity to become friends with & then spend time in the company of two incredibly practical, creative & innovative people. I use the term entrepreneurs in the real sense of the word when describing these two men, they never stop seeing the potential in things & are constantly challenging themselves to make the next thing or create the best resource they can. Neither rests on their laurels & by spending time with them I too began to view things differently. 'Mr Cosy' as I like to refer to Pete! They are Martin Besford from Highway Farm Activity Centre, (www.highwayfarm.com) & Peter Ellse from Cosy Direct, (www.pinterest.com/cosydirect/pins/) I feel very privileged to have spent time in their company & to have them as friends. I would also describe them both as being more like hyperactive 3 year olds than grown men but I do believe that is what makes them both so successful in what they do. If you spend any time in their company, you can't help but feel that anything is possible & sure what's to lose by trying something new or out of your comfort zone. Don't get me wrong, both are the ultimate in professionalism when required to give presentations or running successful businesses but their enthusiasm for life is infectious. As a direct result of being friends with these two I have rediscovered my creative side! I signed up for an 8 week art course this Autumn & was convinced I'd really struggle with the whole creative side of it, as I was so sure I was not artistic, I often joke that I can't even draw a stick man. However, this course has been a real eye opener, mainly because the artist, Anna O'Kane, puts no expectations on any of us. She shows us lots of open ended inspirations & then encourages us to have a go for ourselves. There is never a set look for any end product & each week the 17 of us all usually end up engrossed for an hour & half & with totally different pieces at the end of each session. It has been so refreshing for me to have others pass by as I work & comment 'Oh you are so creative' or 'You have great ideas', I almost feel like looking behind me to see who they are talking to! The idea was to make a willow lantern - I just saw a fish the minute the willow was bent! In the past 5 weeks I have really begun to see the value of being allowed to try new things without fear of getting it wrong or making a mess. It is weird that the very approach I make sure to have with the children in my class is the one I should have been taking in life for myself. That can do attitude is what makes me love teaching nursery & the fact that the children are willing to take risks, try new experiences on a daily basis & dust themselves down if or when it goes wrong & just try again, makes it the most rewarding job in the world. So here's to nurturing the creative side in us all & realising that we are never too old to learn new things, embrace different experiences or think outside the box. This is my print - just experimenting with the shapes & textures. Sometimes I like to do large art activities that a group of children can work on together, without a particular end product in sight. It is always a good activity early in the school year & sometimes draws those reluctant painters in too. 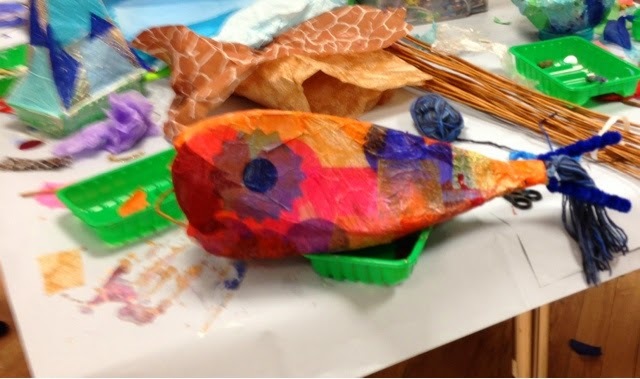 I signed up for an 8 week art course down in Belfast at the Play Resource Centre & each week we get to try different art styles or approaches using mostly the materials from the scrap store, paint & glue. It has been great as I can get new ideas for my class but also can visit the scrap store before the class starts & pick up some new materials for class. Last week I had spied these round foam circles & then in the class we also used some foam dabbers, that were on sale in the art shop. So I decided to let the class have a free reign with these foam shapes & different colours of paint on white card. Some were very precise just printing circles, whilst others used them more like a paint brush to sweep paint across the page. I was particularly pleased when one child, who hasn't painted yet or even really got messy, decided to join in & he even wore an apron - a major step for him. He loved squeezing all the paint from the sponges onto the page before getting his hands onto the page & moving the paint around like finger paint. The white card was shiny so the paint slipped around on the surface. 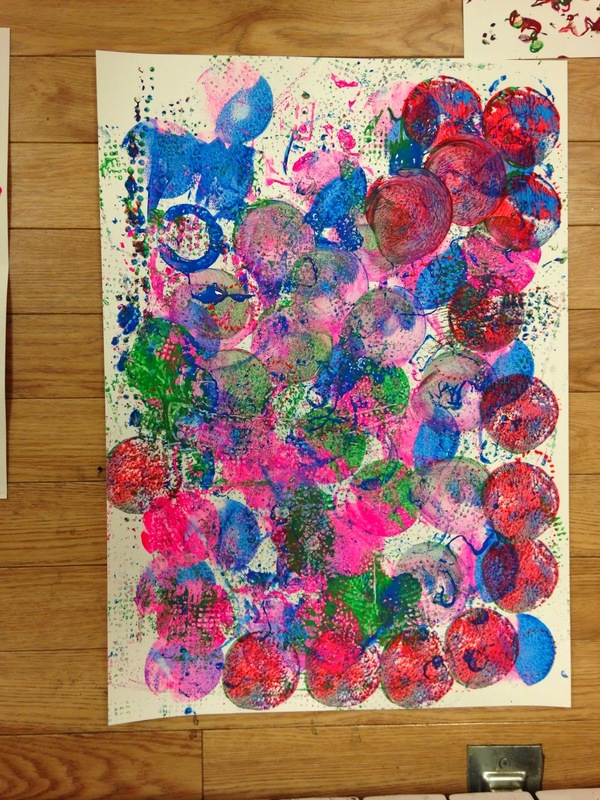 I loved watching one boy print with one colour & a big circle & then add a different colour with the smaller circle into the middle of the first print. Some spent ages at this activity while others did a few marks & then wanted to move on elsewhere. At the end of the hour or so, they had created some lovely art work to hang up in the story room. When I went back the next week there were smaller foam circles in the scrap store in the same material that I plan to gather up next week for some more printing fun. 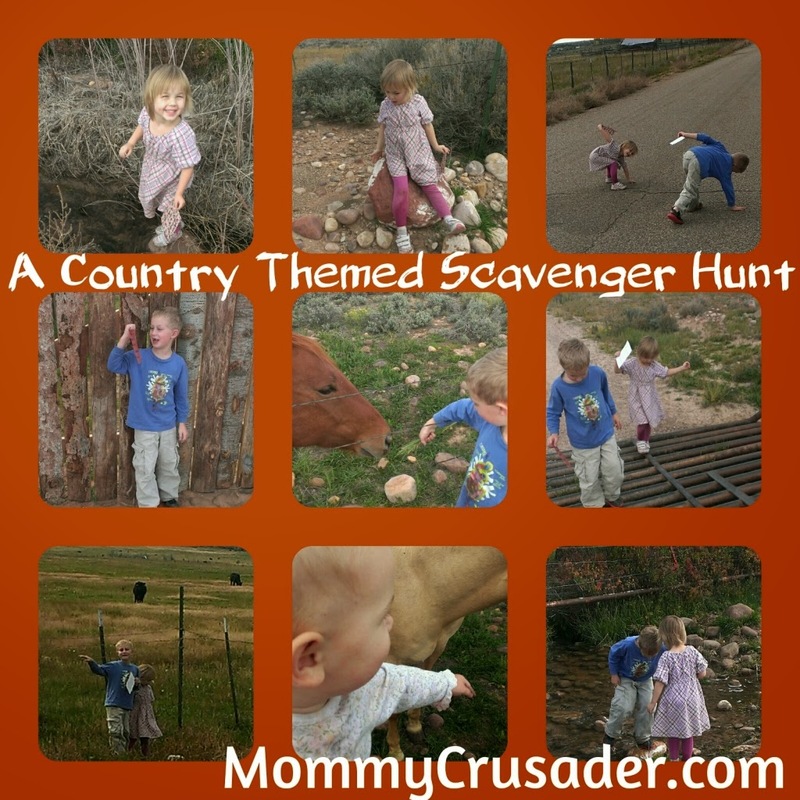 Outdoor Play Party - Visit to Kylemore N.S. 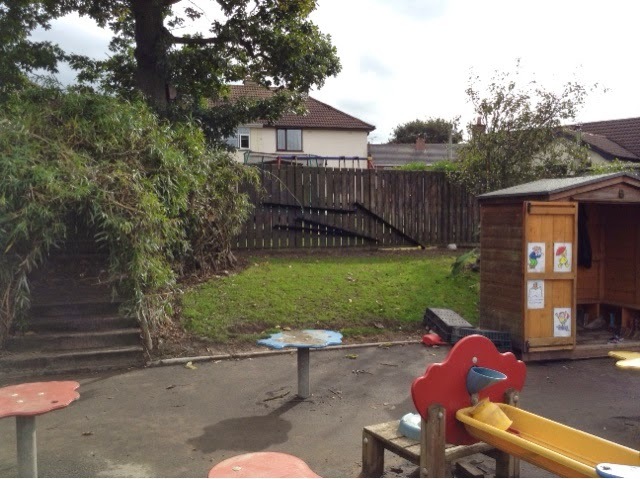 Last week all the nursery staff went to visit another nursery in Coleraine. We hope to make visits like this part of our CPD this year & having been lucky enough to visit settings around the world, I know the long reaching benefits such visits can have. 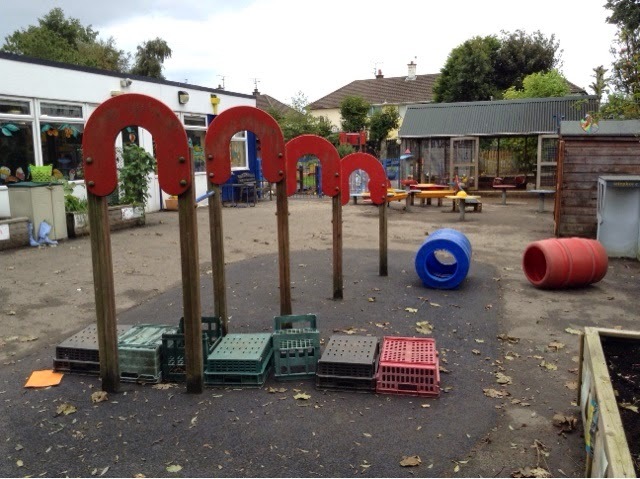 Kylemore N.S was established in 1976, so it is among the first purpose built nursery schools in N. Ireland. I love visiting older, more established settings as they always have a wealth of resources built up over the past years and Kylemore is no exception. We were particularly interested in visiting the outdoor spaces but spent some time indoors too of course. 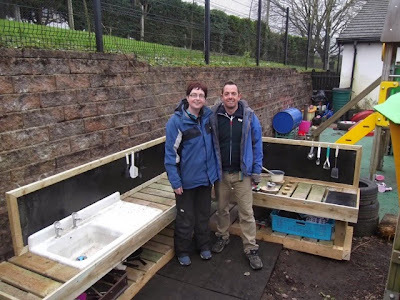 The principal is a good friend of mine, Marian McCouaig & we had travelled over to Derby in July to visit nurseries & I had visited Kylemore last year with staff & governors from Alfreton N.S in Derby, so I knew there was a lot for us to see here. Kylemore has an amazing outdoor space, it is divided up into 3 distinct areas & one is currently under repair. The main playground that the classes were playing in the afternoon we visited is probably bigger than our whole space & even within this mainly tarmaced space there are little natural parts to soften it all. 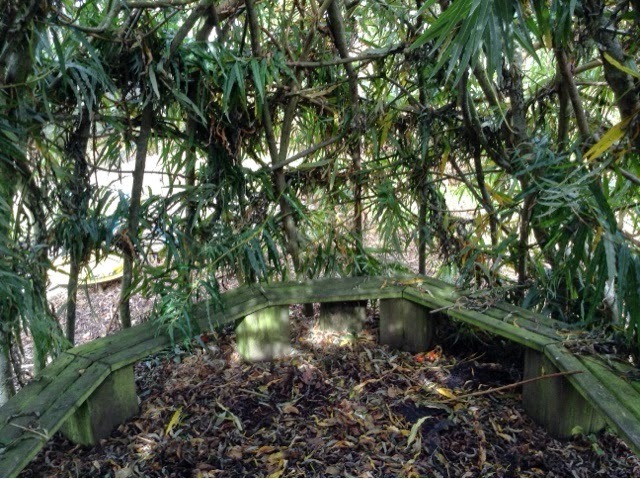 A small grassy, sloped area runs along the back of the playground & there is a lovely willow den built on this slope & incorporating some steps. The large enclosed sand pit area with the steps up into the willow on the LHS. They are lucky to have a big enclosed sand pit in one corner, this is one of the biggest I've seen in any nursery & offered enough space for lots of children to be in it at the same time, with pulleys & diggers etc. In the middle of the playground children had made an obstacle course with bread & shopping crates & all around there were lots of planters full of vegetables. When we visited there were around 52 children on site & yet it never seemed noisy or chaotic as they operate a free flow system so they were never all in the one space at the same time. 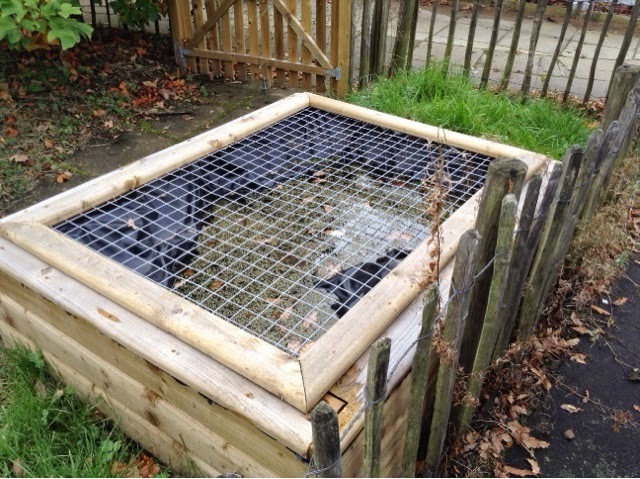 However, they don't have a covered area at all, so if it is raining it would be impossible for them to be outside without all the children getting very wet. Closed off from this main area was another space that used to have a large slide & climbing frame but this had come to the end of it's life & is not going to be replaced with traditional fixed equipment, I can't wait to revisit in a year or so & see what they have put in it's place. Around this area was a fenced in pond & lovely meandering path way under some trees. They are very lucky to have lots of mature trees all around the site. The best part, in my opinion, was another area were they have bark chips & trees & an amazing willow den, that a whole class can sit inside for stories. 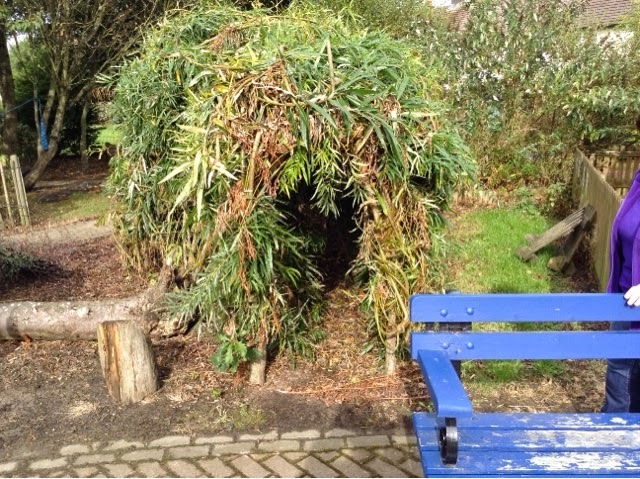 Marian is lucky enough to have an amazing caretaker who took time over the summer to weave in all the new growth to make this willow den look very lush even in October. 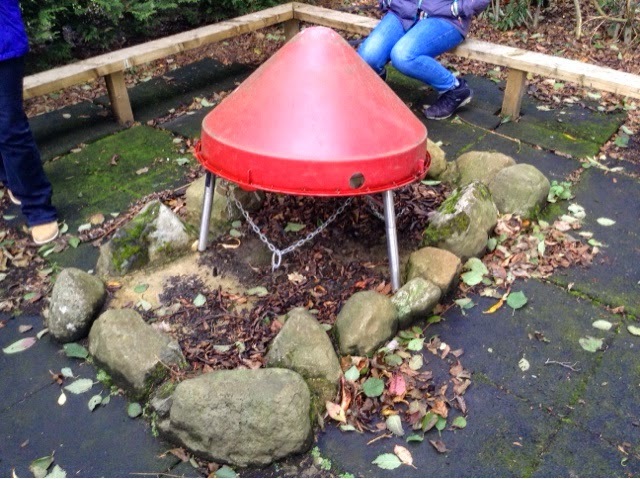 In this more natural 'forest area' they have also built a permanent fire circle for their Haba fire grill & I loved the use of a red top for a lid! This part of the playground felt so different to the main part & was so quiet, with all the tress that were around. I think I would spend most of my time over in this space, there were quirky little additions on the fence - lids that could be painted on etc. 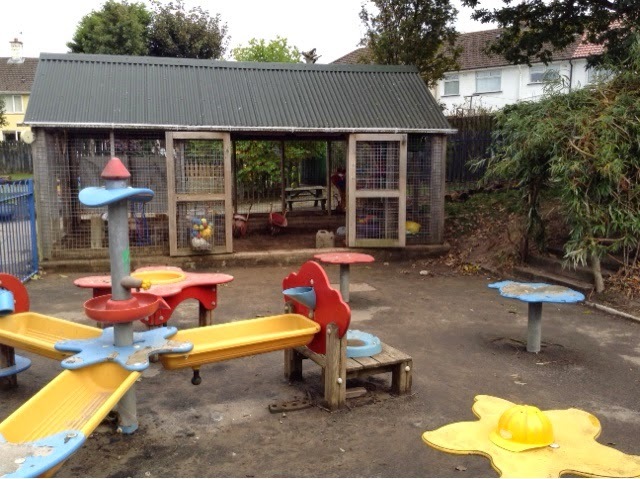 The best element of the nursery's outdoor space that the children were using lots of 'free or found' items to enhance their play & it felt like a space children are allowed to just 'be' rather than a pristine adult planned space. 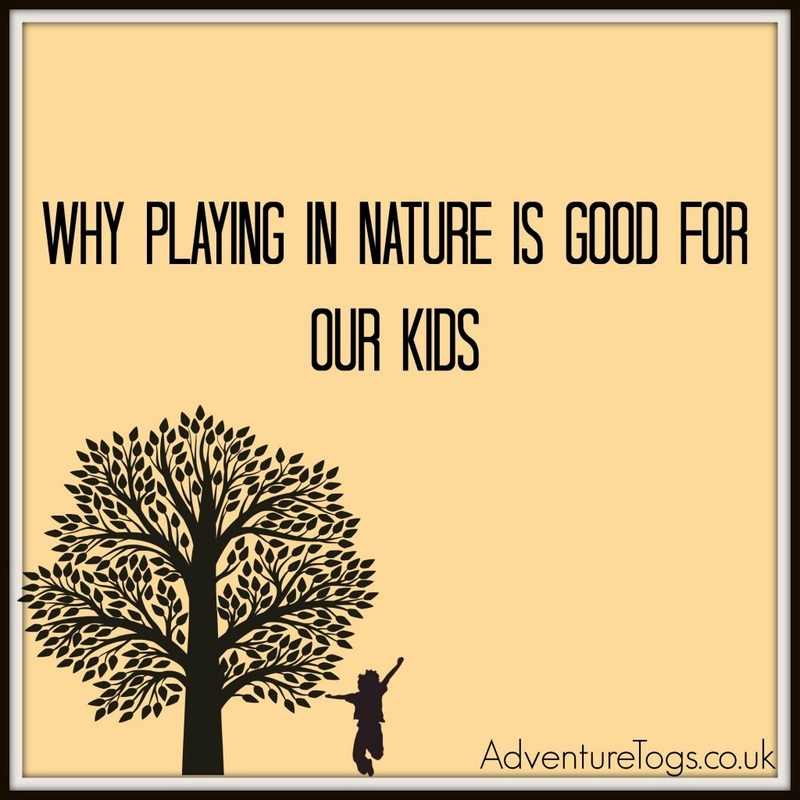 My featured post from last OPP was from Catherine over at Adventure Togs on why playing in nature is so important for children.